Kelvin's friend used to live in Belcarra. Every summer Brant would invite us over for a barbecue. He'd cook salmon while we counted the raccoons nervy enough to come up to us for a bite. After dinner we never missed our twilight walk to Belcarra Bay wharf. There'd always be something going on: fisherman hauling in their crab traps, kids laughing in the adventure playground, a few brave souls swimming in the bay. I always enjoyed going to Belcarra. It was peaceful and very pretty. The drive home, however, I could have lived without. It always seemed like such a long way home. The fact that it was pitch black and Kelvin was busy sawing logs in the passenger seat didn't help matters. Now when we go to Belcarra things are different. We have three children in tow and Kelvin always drives home. Our family loves going to Belcarra Regional Park. Jen likes looking for pretty rocks along the shore and Nathe can't wait to drop his fishing line over the dock. Coleman could spend all afternoon in the playground. He's especially dangerous now that he's figured out how to climb a ladder. Although I have seen people swimming in the water, I'm always leery of beaches with a dock and boats close by. If you want to swim, Sasamat Lake is only 5 minutes away, and by the way, also included in the 690-hectare park boundaries. As are numerous hiking and biking trails, which we haven't, to this date, explored. As I mentioned earlier, from downtown Vancouver, it's at least a 45-minute drive to Belcarra. This usually isn't a problem on the way there when everyone is fresh; the drive home, however, can be another matter. Belcarra Regional Park is a 690 hectare park located on the east side of Indian Arm inlet, near Port Moody. Did you know Belcarra is rich in Indian folklore? 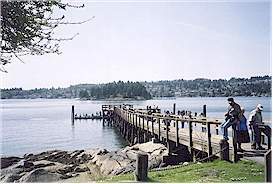 The picnic area by the wharf was home for two Coast Salish Indian villages 3,000 years ago. No less than three archeological sites have been discovered long Belcarra's shoreline. No wonder people are always beachcombing. Nathe has his hopes on finding an arrowhead one day, but so far all he's found is driftwood with a point on it. My husband and I always have fun at Belcarra. For one thing, it brings back fond memories, and for another, the kids never want to leave. I can't wait to try some of the hiking trails; places like Bedwell Bay, Maple Beach, Admiralty Point, and Whisky Cove still await us.